TWO New Ways for YOU to Help Us! 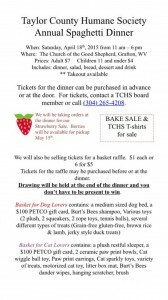 Did you know that TCHS is a volunteer-run operation? We are NOT funded by any county organizations! 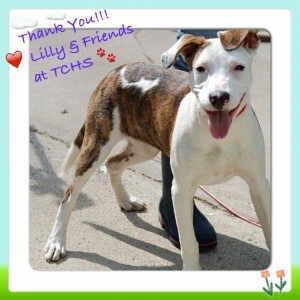 The TCHS volunteers work tirelessly to apply for grant money, fundraise, and accept donations. Without these efforts, there would be no dog shelter in Taylor County, WV. Our volunteers have recently discovered 2 new ways to raise the funds that we need to operate, and we are very excited to tell you about them! These options are easily incorporated into your life, because you’re already doing these things! The first is an app called WoofTrax. You’re already walking your dog every day, right? Download the WoofTrax app and for every mile you walk YOUR OWN dog, WoofTrax will donate to TCHS!!! Donations are approximately .25/mile. If you’d like to make a more personal connection, or you don’t have a dog of your own, come on out to the shelter during our regular hours and walk one of our dogs! WoofTrax will even donate for your time spent at the shelter doing other tasks besides walking the dogs, so you can come help out in the laundry room (have you ever seen how much laundry a bunch of furry dogs can make in a day?! It’s endless! 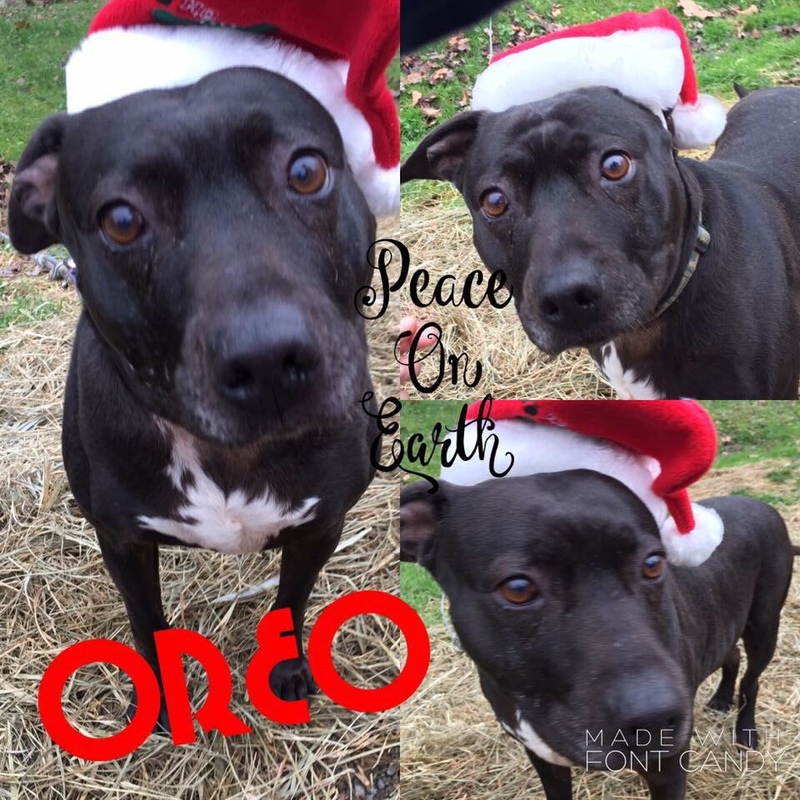 ), bathe dogs, clean kennels, mow or weed eat, and WoofTrax will donate! It’s that easy! The second way that you can help out is by shopping online, specifically on Amazon. Say what?! Well, there’s one little step you must remember… in your browser, type smile.amazon.com to go to the Amazon Smile site. It’s the same Amazon, but when you shop, .5% of your eligible purchases will be donated to the organization of your choice. Please choose Taylor County Humane Society, Grafton WV in order for us to receive the donation. Remember, we rely on YOU to keep these furballs healthy and happy while they await a new home. Please incorporate these easy tasks into your daily routines! TCHS would like to thank everyone who helped make our 2014 Spaghetti Dinner a Success! We appreciate the hard work of all the volunteers (and their families!) who came out to prepare and serve the dinner, as well as the numerous community members who joined us for a great meal! The shelter dogs appreciate you! 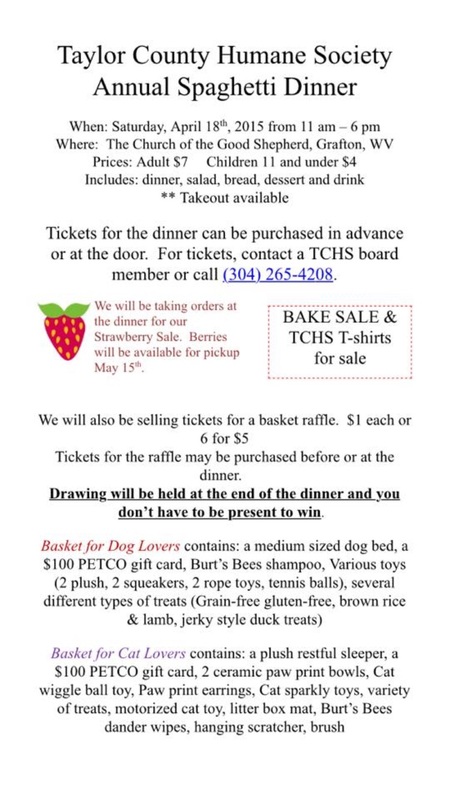 Please join us for the 2014 TCHS Spaghetti Dinner annual fundraising event for our wonderful Taylor County Humane Society!